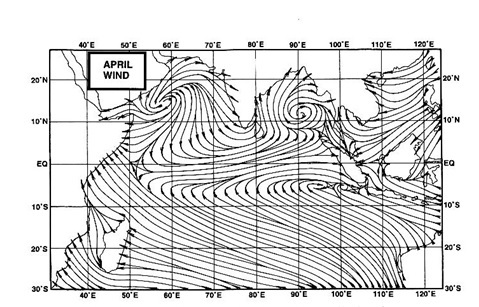 The well marked low is currently ( 9.30 pm IST Saturday) at 10.8N and 67.5E, that is having moved NW in the last 6 hrs. Core pressure remains at 1006 mb, and winds are at 20-25 knts /hr. As mentioned, and seen in the sattellite image put up, the system shows convective clouds in the Western quadrant. Also seen is a weak developing spiral forming. Expected track is N/NW, and precipitation can occur along the Kerala/Karnataka/Goa coastline. As the system tracks, we could see cloudy weather to some rain in S.Konkan from Monday. In the North, weather will be dry. Day and night temperatures are expected to drop by a couple of degrees in North and NW India from Sunday. Delhi should see a minimum of 14/15c next 2 days, and Chandigarh and Amritsar will touch 11c with the day going below the 30c mark. AS-3 has tracked West in the last 12 hrs. 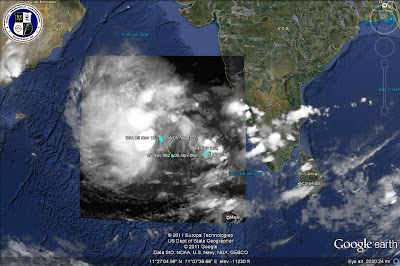 Positioned currently (12.30 pm IST Saturday) at 9.7N and 68.7E, it has a core pressure of 1006 mb. Convective cloudings are seen in the West of the centre. Very mild and dis-organised spiral forming.